All clubs and committees must notify the Trustees' office of when they will be using the hall or social club for meetings or events. The schedule is tentative and subject to change. We encourage all Aerie and Auxiliary members to attend the District 1 Meetings. The Eagle Riders offer members with an interest in motorcycle riding an opportunity to organize and put together charitable events while doing what they love. Each year, Eagle Riders groups across the United States and Canada raise money through Poker Run events and other motorcycle activities that help unite community members and build a passion and appreciation for our surrounding landscapes. The Van Buren Eagle Riders help the Aerie as well as the MDA Camp Cavell for kids near Lexington, MI, Toys for Tots , and the Wounded Warriors Project. The Riders signature project is the annual HOG roast which takes place in September. The Events page will have details as we get close to the date. Eagle Rider meetings are held on the second Thursday of each month at 6:30 pm. in the social room or the Pavilion, weather permitting. It is not necessary to have a motorcycle to join. We passed a motion to let all previous members who have let the membership lapse rejoin for the annual fee of $10.00. All Riders shall be in good standing in the Van Buren Aerie or the Ladies Auxiliary. ALL candidates shall be in good standing in Van Buren Men's Aerie or Ladies Auxiliary. The Van Buren Eagles REAC welcomes all new members. We have social events every third Tuesday of the month. The events are voted on by the members of our group; we would love to hear your ideas on new places to visit. Our annual events are the June and September (first Tuesday) meetings. Grilled hotdogs are supplied and members bring their favorite dish to share. Our December meeting is a Christmas dinner meeting with the dinner supplied by REAC for members' enjoyment. Guests are always welcome to come to a meeting to see what we are about. 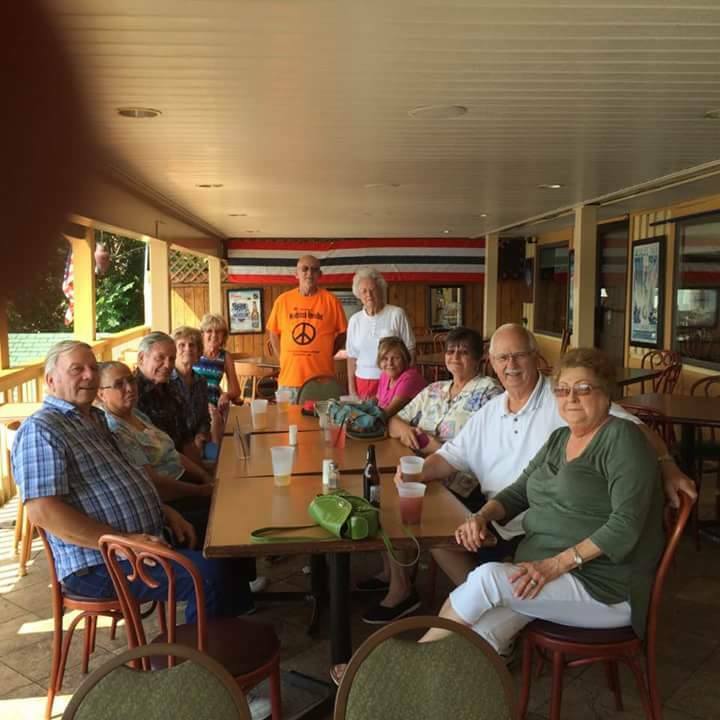 REAC members having fun at one of their outings, a Pub Crawl in Belleville, MI on July 19, 2016. The Junior Order of Eagles offers youth the chance to learn and uphold the principles and beliefs of The Fraternal Order of Eagles while beginning their philanthropic efforts at a young age. With the guidance of sponsors, J.O.E. clubs perform tasks within Aeries and hold various fundraisers to benefit local causes that affect or interest children. What? You don't know how to quilt? Well, join our group and Michelle will teach you how to quilt, step-by-step, when we meet on the second and fourth Monday nights of the month.